Below are listed information known about some of the smallest, lightest water guns and water blasters released to the consumer market. Information below is given to the best of our knowledge, but will be updated as additional information becomes available. 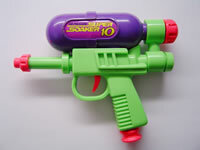 Released in 1993, the Super Soaker SS10 remains the smallest air-pressure-based water blaster ever sold in stores. 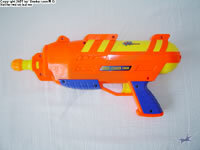 Its diminuitive size made this blaster easy to pocket and conceal while its air-pressure mechanisms gave it a stream performance advantage over similarly sized pump-action water guns. The Speedloader 1000, released in 1999, is the smallest known stock water blaster that utilizes an elastic bladder to pressurize its watery contents. 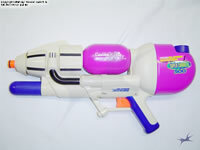 However, unlike most other water blasters and water guns, the Speedloader 1000 is fully dependant on a water hose to charge the pressure chamber; the blaster, itself, has no means of pumping to build pressure.